I never want to go to Charleston just for the day. Living in Columbia, that is a good four hours on the road for only about five-six hours in the city. But, if a day is all you’ve got, let me tell you something great to do. First of all, go to Captain’s Source (843-767-4200; http://captainssource.com/) and book a sail or harbor cruise. We left from the Patriots Point Marina in Mount Pleasant for two of the most relaxing and fun hours I have ever spent on a day trip. Since the cruise was 2:30-4:30 p.m., we had a perfect plan to arrive in the city by 11:30 a.m. for brunch before heading to Mount Pleasant to get on the boat. We chose Carolina’s: A Southern Bistro (843-724-3800; www.carolinasrestaurant.com), just south of Broad and one of the few restaurants in Charleston that I had never visited. Carolina's just south of Broad is a perfect Sunday brunch spot. The place is warm and brightly decorated, especially for brunch with the early Sunday sunshine streaming through the oversized windows. The front room is flanked by two large banquettes and banquettes line the back wall of the lower back room, which also has a bar made for eating. Carolina’s offers a bottomless mimosa (in three flavors) for just $14 (the price of two, if you’re not going bottomless). We had the Poinsettia (with cranberry juice) and the bellini (champagne with peach nectar). For food, we started with the roasted tomato bisque. It was a fantastic explosion of flavors and very rich. A little taste was perfect. Then came the Hangtown omelet: an open-faced omelet with fried oysters on top. On the side were salt-roasted smashed fingerling potatoes. The house specialty is the crab cake Benedict, which is a minced-meat crab cake on top of a fried green tomato with two perfectly poached eggs and Hollandaise sauce on top. The Anson mills grits on the side were cooked perfectly. 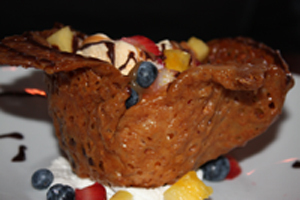 For dessert, we had French press coffee and a pecan yummy dish comprised of ice cream served in an edible basket made of something like pecan-pie filling with fresh fruit on top. It was ooey, gooey, goodness. Pecan goodness bowl filled with ice cream and fresh fruit at Carolina's. After that huge meal, we needed a walk. From the Carolina’s location at Exchange and Prioleau streets, it is just a short stroll to waterfront park and wonderful views of Charleston Harbor, Fort Sumter and, with the right lens in the camera, a look at the Sullivans Island lighthouse. It was a beautiful, sunny fall day, so there was a cool breeze and plenty of sunshine. After our stroll, we hopped into the car to head across the harbor the hard way and to Patriots Point. The drive took about a half-hour and although Capt. Mike had invited us to bring our own adult beverages, we had had enough at brunch. Some of our sailing companions brought cheese, crackers and some red wine. Capt. Mike and first mate Michelle had plenty of water and sodas if we needed. The “Emotional Rescue” lived up to its name as we all settled in and let Mike and Michelle take care of all the grunt work of rigging the sails and getting us out into the harbor. It was a fairly crowded day as folks were taking advantage of a warm November day to say good-bye to sailing for the season. Capt. Mike at the helm of the "Emotional Rescue." 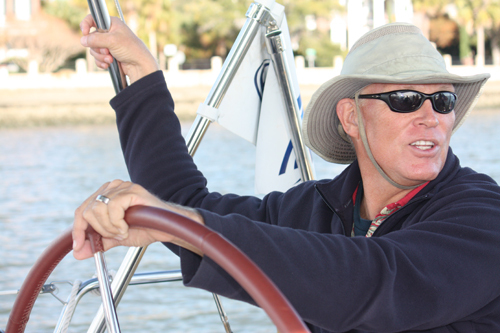 Mike lets you feel what it’s like to catch some wind in your sails, but keeps the keel fairly even so you can walk out onto the foredeck and can snap some great shots of the Battery and the Ravenel Bridge. We were pulling into our slip just as the sun was sinking behind the steeples of the Holy City. Patriots Point happened to be hosting an oyster roast on Sunday, but we had miles to drive before our sleep, so we headed off to Trader Joe’s (843-884-4037; www.traderjoes.com/website) for some shopping and stopped in Summerville for a quick bite to eat – but that’s another story for another day. 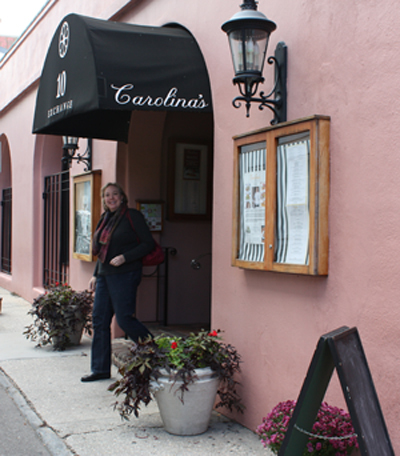 Carolina’s: A Southern Bistro (843-724-3800; www.carolinasrestaurant.com) 10 Exchange St., Charleston. Open daily at 5 PM for dinner; 10 AM-2:30 PM for Sunday brunch. Prices: This is definitely a “Dining Out” dinner or brunch. We spent $100 (taxes and tip included) on brunch for two with cocktails, appetizer, entrees and dessert. Waterfront Park (843-762-2172; www.charlestoncity.info) Concord Street. Captains Source (843-767-4200; http://captainssource.com/). Tours are by appointment only and prices vary widely based on trip chosen. Trader Joe’s (843-884-4037; www.traderjoes.com) 401 Johnnie Dodds Blvd., Mt. Pleasant. Open daily 8 AM-9PM. This grocery store is famous for its Two-Buck Chuck – a collection of wines for $2.99. It’s highly drinkable and, at those prices, well worth the drive. Although Trader Joe’s is a chain, it has the feel of a neighborhood grocery, which is fairly hard to come by in these big-box days. This entry was posted in Dining Out, Shopping, To Do and tagged Carolina's, Charleston, Sailing, Trader Joe's, Waterfront Park. Bookmark the permalink.